The Gnarls Barkley collaboration didn’t bring producer Danger Mouse to the top of the British charts for the first time, but it did mark his debut as the pilot of a hit record. Mouse, born Brian Burton, first gained the ears of discriminating listeners when he concocted The Grey Album, a bootleg that mashed the vocals from The Black Album by Jay-Z with music samples courtesy of The White Album by EMI flagship the Beatles. Although the label posted a cease-and-desist order, one of their employees, Damon Albarn of Blur and Gorillaz, was one of the impressed, and he hired Burton to create the beats for the second Gorillaz album, Demon Days. 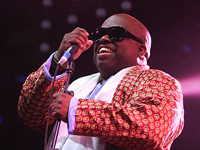 Just one year later, Danger Mouse was back in the charts with another collaboration project, Gnarls Barkley, with singer Cee-Lo Green (a solo artist and former member of Atlanta’s Goodie Mob). The pair had met in Atlanta in the late ’90s, and began recording together around the time of a 2003 DM record titled Ghetto Pop Life.